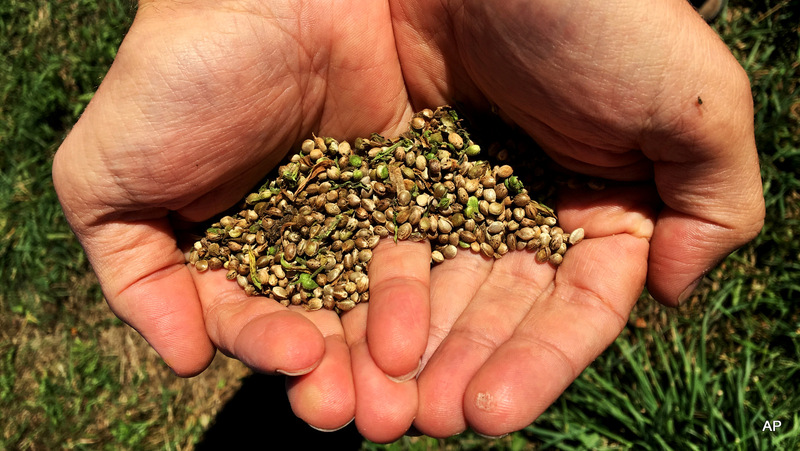 This Sept. 25, 2016 photo, shows seeds from the first legal crop of industrial hemp grown on JD Farms in Eaton, N.Y.
AUSTIN, Texas — America’s burgeoning hemp industry faces significant barriers that can only be torn down by the full legalization of this potentially lucrative crop. Hemp was once one of America’s essential crops, grown by presidents and cash croppers alike, and wars were fought over access to this valuable commodity. It became illegal to grow hemp in the United States with the passage of the Controlled Substances Act of 1970. The federal law bans all forms of the cannabis plant, even though industrial hemp has very low levels of THC, the main active ingredient in cannabis that’s grown for recreational or medicinal use. 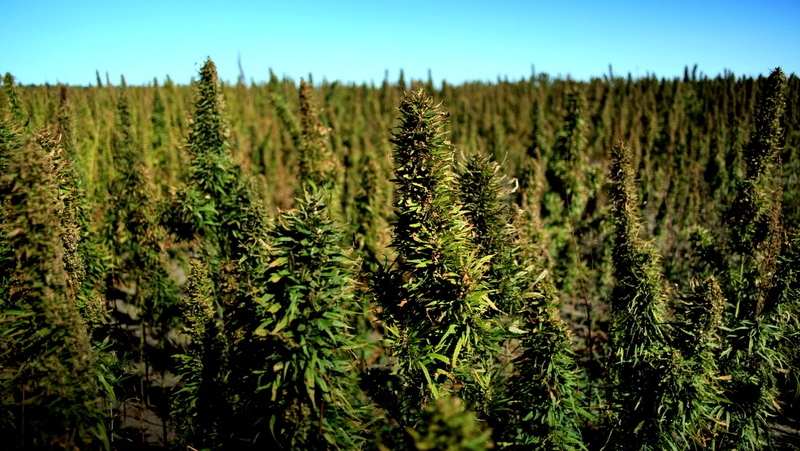 The 2014 Farm Bill reopened the door to legal hemp cultivation by allowing states which had legalized industrial hemp to license farmers to grow the plant for research purposes, including market research. But many aspects of federal regulation and law surrounding hemp remain “opaque” and confusing, according to John Ryan, founder and director of Ananda Hemp. A subsidiary of the Australian hemp company EcoFibre Industries, Ananda Hemp is growing hundreds of acres of hemp in Kentucky and Tennessee. “There’s some barriers in the regulation that still need to be sorted out for this industry to really thrive,” Ryan told MintPress News. Twenty-five states and the District of Columbia have laws legalizing cannabis in some form, whether medicinal, recreational or agricultural, and the Drug Enforcement Agency has cooperated with the Farm Bill’s reforms, including licensing growers like Ananda Hemp. However, on the federal level, hemp remains classified by the DEA with other forms of cannabis as a Schedule I drug. It’s classified among substances like heroin and cocaine, which are considered highly addictive and lacking in medical benefits. Ryan said this legal gray area means banks and other sources of investment capital are hesitant to invest in what they perceive to be a “high risk” industry. “You’ve got essentially a Catch-22, where we need to deploy some serious capital to get the supply chain running, but private equity or bigger sources of capital aren’t going to get in until there’s a more clear definition of federal legislation,” he said. This murky legal landscape is creating a struggle for vendors of hemp products, too, according to Gunhee Park, co-founder of Ministry of Hemp, an online boutique selling hemp-based products which also offers educational resources about the benefits of hemp. Despite some initial success, Park has found that the stigma surrounding even legal hemp products makes it hard to do business. Facebook has repeatedly rejected the Ministry of Hemp’s advertisements, limiting the company’s social media reach, and payment processing companies like PayPal and Shopify have repeatedly rejected his business. “So many of the payment processors just auto-rejected us and wouldn’t even budge when we reached back out as an appeal,” he told MintPress. In this May 19, 2015 photo, biomass company CEO Ed Lehburger examines a barrel of shredded hemp on the way to being turned into pulp and used for paper and other products, at Pure Vision Technology, a biomass factory in Ft. Lupton, Colo. While most states initially opened up hemp growing only to growers associated with universities and educational institutions, Kentucky was unique in allowing licensed tobacco growers to begin experimenting with hemp. 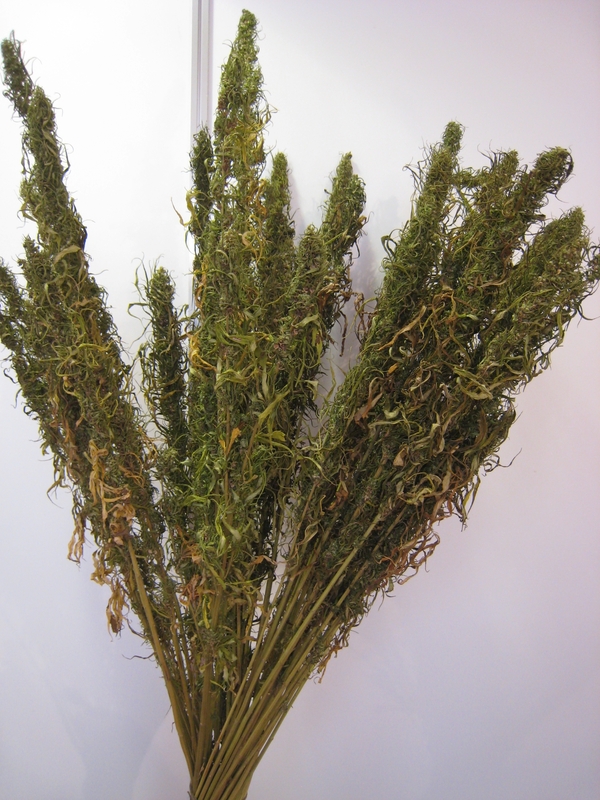 Many of those varieties were better suited for growing in the American South than more commonly available European or Canadian varieties of hemp. Furnish grew a small test crop in partnership with Ananda Hemp in 2014. After this trial proved successful, they quickly expanded. “We did about half an acre in 2014, we’ve scaled now to 500 acres in production this year,” said Ryan. The legal issues mean hemp growers have to build the supply chain and infrastructure of their business “from scratch,” Ryan said. Despite the legal barriers, hemp’s popularity as a crop continues to grow. “You look at how well hemp has done in Canada, Europe, and China, it only makes sense that you could eventually — it’s certainly not easy — eventually create a billion-dollar industry here,” Ryan said. The Ministry of Hemp’s Gunhee Park told MintPress that he stumbled upon the hemp industry “quite incidentally,” coming across a hemp product without knowing anything about the plant. He’s since become an evangelist for the plant, touting the benefits of hemp products. He launched Ministry of Hemp earlier this year primarily to educate people, but also to share some of his favorite products. Hemp is a high-protein food and an environmentally-friendly textile (particularly compared to cotton). It also has a range benefits in bodycare products. The trouble for Park started just as his “ministry” started reaching a growing audience online. Facebook rejected his attempts to purchase paid advertising, and his attempts to appeal the initial rejection proved fruitless. Park noted a double standard at play, highlighting the ease with which major retailers like Wal-Mart and Amazon are able to successfully integrate hemp-based products into their inventories. Ananda Hemp’s partner in the hemp fields, Brian Furnish, is now an advocate for the agricultural potential of hemp, appearing in the media and lobbying for legalization as part of the Kentucky Hemp Industry Council. Together, the Kentucky Hemp Industry Council and the Hemp Industries Association are lobbying the federal government to reschedule hemp and fully legalize hemp growing. “Regulation is a definite barrier, but there is some light at the end of the tunnel hopefully,” said Ryan. Until Congress enacts federal reform, though, the hemp industry’s growth is likely to be limited for growers, vendors and everyone in between. A gonzo journalist from Austin, Texas and Staff Writer for MintPress News, Kit O’Connell’s writing has also appeared at Truthout, the Texas Observer, and The Establishment.